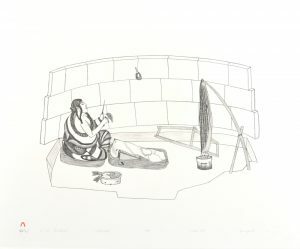 An accomplished printmaker, Kananginak Pootoogook produced drawings and prints for the graphic arts program since the late 1950’s; his work was included in almost every annual collection since that time until his passing in 2009. A prominent community leader, Kananginak was instrumental in the formation of the West Baffin Eskimo Co-operative graphic arts program at Cape Dorset, and served for many years as President of its Board of Directors. 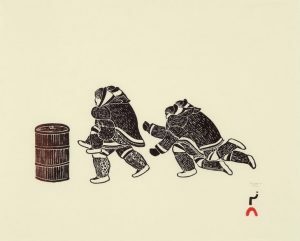 His first print, a collaborative image with his father, Pootoogook, was included in the first catalogued collection of Cape Dorset prints in 1959. 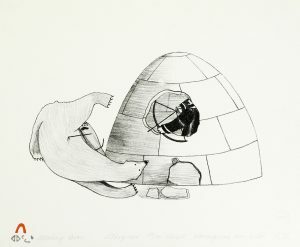 Kananginak was highly skilled at representing Arctic wildlife in his work. He was especially capable of drawing the many species of birds that frequent the Arctic. 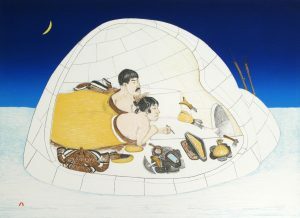 In later years he focused more on the culture of the Inuit, producing realistic, narrative drawings of camp and hunting scenes. In 2010, Kananginak was given the National Aboriginal Achievement Award for his work in the Visual Arts. 2010 Awarded a National Aboriginal Achievement Award in the Visual Arts. Gustavison, Susan. Northern Rock: Contemporary Inuit Stone Sculpture. Kleinburg: McMichael Canadian Art Collection, 1999. Hessel, Ingo. Arctic Spirit: Inuit Art from the Albrecht Collection at the Heard Museum. Pheonix: Heard Museum, 2006. Houston, Alma. Inuit Art: An Anthology. Winnipeg: Watson & Dwyer Publishing, 1988. Houston, James. Eskimo Prints. Toronto: Longman Canada Limited, 1971. Printmaking. Ottawa, National Gallery of Canada, 2009. Norton, Derek, and Nigel Reading. Cape Dorset Sculpture. Vancouver: Douglas & McIntyre, 2005. Ryan, Leslie Boyd, ed. Cape Dorset Prints: A Retrospective. San Francisco: Pomegranate, 2007. Roch, Ernst (ed.). Arts of the Eskimo: Prints. Montreal: Signum Press, 1974. Swinton, George. Sculpture of the Inuit. Toronto: McClelland & Stewart Inc., 1999.